Theomania, the desire to be like a god, is alive and well today. Theologian Christoph Schwöbel notes that there is an interesting historical-cultural coincidence between the birth of radical concept of freedom and the denial of God in Western philosophy. He suggests that it results from humans attempting the kind of freedom one normally attributes to God—omniscient, omnipotent, infinite. This perspective on freedom tends to imply that the self must occupy or usurp the space once given to God in Western consciousness—human and divine freedom in a strange way are set up in a direct conflict and competition. This has dire consequences; the quest for immanent radical freedom can sacrifice unnecessarily much that is good in life, and perhaps to some extent my well-being. Not so long ago, Friedrich Nietzsche (1882) declared that ‘God is dead’. The final nail in the coffin comes from Nick Carr (2010) in ‘The Shallows’ recounting our newfound faith in the ‘church of Google’. In our supposedly post-secular, post-Christian context, this is taken for granted. Yet as the famous Geographer David Harvey writes, more often than not, ‘the status is nothing to quo about’. This piece takes an interest in smartphones: the iPhone, HTC Android, Blackberry, and the like. As the Economist (2011) recently wrote, are we ‘slaves to our smartphones’? Their ubiquity demands discussion. I wonder to what extent a traditional God who exudes aseity – or what theologians describe as self-sustaining life and unending energy – is rapidly being reduced if not replaced by novel technologies. 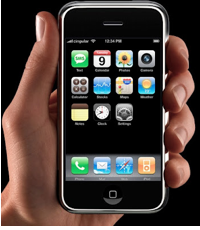 The release of the iPhone 5 just weeks ago conjured up a storm. Perhaps portable, mobile devices are becoming ‘the [new] rage, the law and fashion of the Age’ (S.T. Coleridge, 1824). Interestingly, for Regent College scholar Craig Gay (1998), such tools of calculation can encourage ‘practical atheism’, whether we like it or not. For secular and religious types alike, the insidious traits of pervasive technologies undermine a transcendent God. Such instruments may be realizing Benjamin’s (1932) ‘decline of aura’ and loss of awe. With a smartphone in hand, the world literally is at our fingertips – the virtual world of information and ideas becomes accessible at the touch of a button. Yet what of wonder, mystery, and majesty? In our awe-deficient world, the question to ask is whether such technologies encourage or dissuade us from praise and worship. As Canadian Philosopher Charles Taylor argues, life reduced to the immanent frame is the greatest blindspot of secular, Western culture. This view eclipses our ends and reduces our horizons. So how, as thinking, considerate graduate students are we to guard against this?